Home Government News Presidency Election Presidency Election 2016 President of the Philippines Running for President Senator Grace Poe TAPOS NA POE: Supreme Court Approved Grace Poe's Presidential Candidacy. 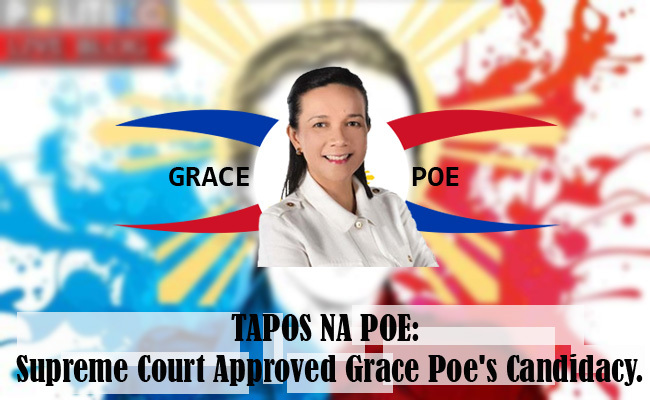 TAPOS NA POE: Supreme Court Approved Grace Poe's Presidential Candidacy. It will be a game changer. Most of political and social experts believe that the recent decision of Supreme Court favoring the petition of Senator Grace Poe to reverse Comelec's decision of disqualifying her as a Presidential candidate will make a relevant effect to the Presidentiables' current standings in the surveys. After 5 days of oral arguments, the Supreme Court en banc decided on March 08, 2016 (Tuesday) to allow Independent Presidentiable Senator Grace Poe-Llamanzares in running for the highest Executive position. On the same day, SC Public Information Office Chief Theodore Te announced the decision but refused to disclose further information as the full ruling is yet to be released. SC had conducted two separate deliberations regarding the residency and citizenship cases against Poe. 9 out of the 15 magistrates favored Poe including Chief Justice Maria Lourdes Sereno, Presbitero Velasco Jr, Diosdado Peralta, Jose Perez, Lucas Bersamin, Jose Mendoza, Marvic Leonen, Benjamin Caguioa and Francis Jardeleza. Sereno, Leonen, Jardeleza, and Caguioa are appointed by President Benigno Aquino III who has been very vocal in supporting Liberal Party standard bearer Mar Roxas. However, Teresita Leonardo-de Castro, Antonio Carpio, Arturo Brion, Estela Perlas-Bernabe, Mariano del Castillo, and Bienvenido Reyes voted against Poe. Bernabe and Reyes are the only appointees of PNoy out of the 6. While the three of them naming Carpio, Brion and De Castro were initially part of the Senate Electoral Tribunal that earlier favored Poe in a 5-4 result. The 3 justices also voted against the senator in SET. Manuelito Luna, one of the three petitioners to disqualify Poe, will submit a motion for reconsideration against SC ruling. While the other petitioner University of the East Law Dean Amado Valdez said that the ruling is unconstitutional and a betrayal of public trust which has been the same sentiment of Comelec. Meanwhile, in a text message sent to GMA News by Atty. Carlo Vistan of University of the Philippines College of Law and an election expert, Supreme Court's decision may still be questioned especially if the decision was just based on 'good faith'.